Which Hilton hotels can you book for just 5,000 points per night? Every couple of months, IHG Rewards Club generates a wave of publicity – including on Head for Points – by reducing the reward cost of 100 or so properties. They are all offered for 5,000 points per night, a discount of up to 95%. You probably saw the latest list a couple of days ago. Hilton HHonors, however, has 49 hotels which are 5,000 points per night EVERY NIGHT. Given that some of their hotels now run to 95,000 points per night, these are a great deal if you need to be anywhere near one of them. This list is especially interesting given that Hilton is currently offering a 100% bonus when you purchase Hilton HHonors points. This takes the cost per point down to as little as 0.5 cents. I wrote about this offer yesterday. You can see a list of the 49 hotels which sell for 5,000 points per night here. Given that Hampton properties include breakfast, it is probably cheaper to live in one of these hotels at 5,000 points per night than rent a property locally! Seven of these hotels are in Egypt, including Hilton Pyramids Golf Resort. Remember that Hilton also gives 5-night redemptions for the points of 4, so you could book five nights here for just 20,000 Hilton points! Turkey, Malaysia, China, Argentina, Mexico, the US and India also crop up. The Hampton in Krakow is also on the list. This is the cream of the crop, though. The Hilton Salalah Resort in Oman. From 18-23 September, as an example, it costs £95 per night including tax and service for the basic room – which is still a huge 450 square feet! Alternatively, you could pay just 20,000 Hilton HHonors points (a transfer of just 10,000 Amex Membership Rewards points) for those same five nights, saving £475! This assumes you have Hilton status and qualify for the ‘5 nights for the price of 4’ deal. Hilton Silver status comes free with their UK credit card. 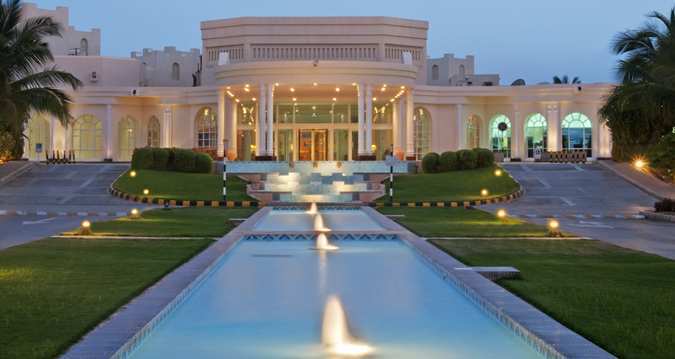 If you missed it when the article first ran, here is a review from HFP reader Nick who booked the Oman hotel after reading about it on this site. Tomorrow I will take a look at some 10,000 per night properties. The 10,000 point ones are great value too. I booked the Liverpool airport Hampton for 4000 points + £23, cash price was £90! Worthy of note is that Oman air business class seems to be quite highly regarded and I have sometimes seen very competitive fare offers on the to/from far east. I would guess these allow stopovers. I am not sure if I heard properly but I thought there was a suggestion on channel 4 news Thursday night that trouble in neighbouring Yemen was in danger of spreading to Oman. There’s a reason that it’s only 5,000 points per night: it’s not that great! The photo of the hotel makes it look magical. But when you arrive it is nothing like that at all. It is in a once planned development area north of Salalah, that hasn’t been developed. And for a ‘resort’ hotel, is tiny. There’s a small pool and a chap running a shisha cafe. And that’s about it! The hotel is well run and well worth a visit. But it’s nowhere near the ‘jewel in the crown’ Middle Eastern metropolis that the Hilton stock photo portrays!! And be wary of visiting during Ramadan – although it’s probably one of the few places in Oman where you can drink a beer – in the privacy of your room – your room itself will very much not be dry, but very humid. There’s a reason the hotel is empty in June/July and begins to fill up when Muscat gets too hot! Well worth a visit if in the area. But I suggest that expectations are lowered a bit! Hi Paul, the reason it’s so busy in July is due to the khareef; so it’s a magnet for locals across the region to get some respite from the otherwise baking heat! We took it for what it was … do that and you won’t be disappointed! I stay at the Corby Hampton Inn a few times a year. I have a regular meeting nearby, and sometimes stay there th night before to save having to drive down in the morning. It is incredible value. For £17 of points, the rooms are fine and you get breakfast thrown in. Can’t go wrong really. The hotel in Malaysia is in Johor Bahru, the other side of the Straits from Singapore – that could be a bargain way of seeing Singapore and the southern tip of Malaysia, theres even a Legoland nearby! Previous posts have suggested using the IHG credit card for Hilton stays triggers the bonus IHG points (IHG and Hilton cards are Barclaycard), would this be the case with Hilton points? Or is the purchase via points.com? points.com process it so I am fairly certain their name appears on your card statement. I used the 5000 point redemptions for a week at the Hilton Fayrouz in Sharm el Sheikh, and visited a couple of the other Hilton properties. They are mostly all inclusive holiday factories but with free internet and free breakfast via Hilton Diamond it makes for a very cost effective diving break. Is itvevercwirth doing mattress runs, at Hampton Corby, to get points and status. Looking at trying to earn points, plus the 100% Hilton bonus, for a trip to Rangali Island. I booked Hilton Sharm Waterfalls Resort for 10 nights for 40500 points via Silver status (working my way back to Gold) later this year. May not be the most greatest Hilton, but will be good enough for 10 days in the sun. Can’t argue with 1.3p value per point at thats factoring in the 30% summer sale discount. Flights booked via BA with Avios at 1.1p value can’t argue with a cheap getaway. Well, I’m having issues with my accommodation in Northampton at the moment so can definitely come to a deal alongside doing the legwork on some mattress runs!